tried the shiseido black mask on my nose earlier on and wow, so many blackheads! seriously, of my face, i kinda gave up hope trying to make it better already. even the strongest cream the doctor prescribed me doesn’t seem to work. haha, i guess my only wish now is that it doesn’t get worse? the process of making my beloved wonderful creation – japalang baked rice. 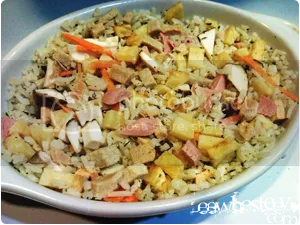 basically, it’s the mixture of the ingredients from all other baked rice into just one bowl. seriously, this is the best tasting one but TOO BAD, it’s not for sale. it’s labelled staff-only-by-tsehwee. we also had japalang pizza which also consist of all ingredients from all pizzas. vanilla ice cream was spotted again in the fridge. 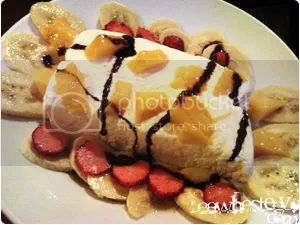 and with strawberries, mangoes and bananas available, we decided to pamper ourselves with some fruity ice cream treat. i’m such a happy girl today because i had mangoes again when i got home. and yes, it’s one of my favourite fruits. business was pretty alright today and i had ample time – i think an hour or two – to tidy up some reports in my laptop. but of course, without the use of internet; i’ve yet to pluck enough courage to ask the neighbouring stalls for their wireless connection.